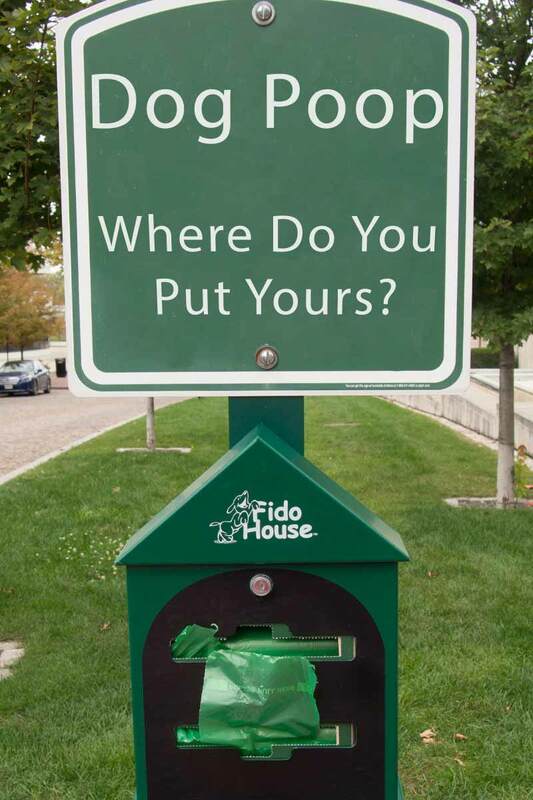 Dog Poop Disposal - Where Do You Put Yours? 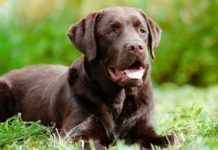 Home Labrador Care Articles Dog Poop Disposal – Where Do You Put Yours? It’s estimated that there were over 89 million pet dogs living in the USA in 2017. With every dog pooping two or three times a day, that is a whole lot of dog poop. And it has to go somewhere! When I was a kid, in the 1960s dog poop on sidewalks and pavements was a common sight. Dogs were allowed to roam freely around towns and villages. And they pooped wherever they felt like it. Why didn’t people pick up poop? Pretty much no-one would have dreamt of picking up a piece of dog poop in 1960. Anyone doing so would have been widely regarded as mad or depraved. Many a family outing was punctuated by angry parents scraping dog mess from their childrens’ shoes. Over the next two decades, the slow trend towards taking responsibility for what comes out of our dog’s behinds began. Starting with a campaign to encourage people to step off the sidewalk and ensure that their dogs pooped in the street, not on the pavement where people tread. That campaign was not very successful. Collecting poop isn’t a great job though is it? There was huge resistance from dog owners when they were first asked to do this. No-one enjoys it. And a great many devices have been invented to try to make the job easier. Where to throw that poop bag! Sometimes we may be tempted to drop it in the nearest trash can. Living at the entrance to a popular dog walking area, my own trash bin is often used this way by passing strangers. I’m okay with this but I know that some of you are not. It’s quite an interesting debate so feel free to add your own views in the comments box below! In today’s article we are going to look at dog poop disposal in some detail. at the different methods available to us. Most of us can see the sense in picking up dog poop on pavements. After all, no-one likes to tread in it. But what about large open spaces? Surely this is a natural substance and will just ‘rot down’ without causing anyone a problem. Well it seems that dog poop is a much bigger problem than many of us might think. And not just in our streets. 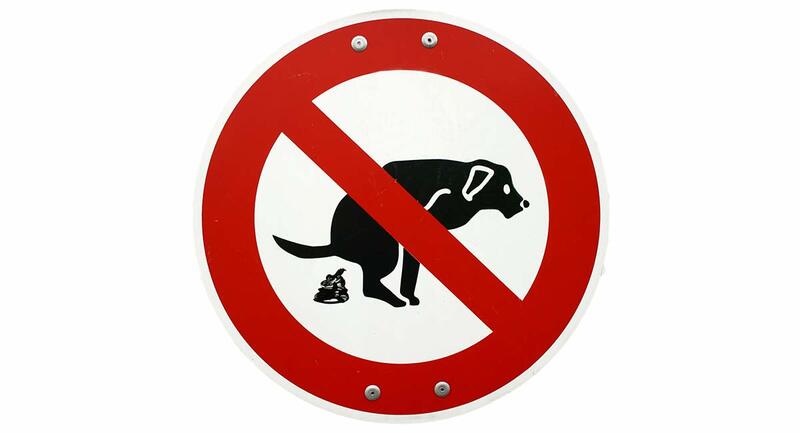 Dog poop is a major source of waterborne pathogens such as Giardia and Cryptosporidium. So allowing dogs to poop in or near streams, or rivers (often popular dog walking areas) is a really bad plan. Dog feces also carry parasites such as intestinal worms that can infect people. Children are especially vulnerable because they play in the dirt and have poor hand hygiene. Of course, it isn’t just humans that are at risk from dog poop. Other dogs are too. And the chances of your dog picking up parasites or other nasty infections from the dog park are significant. 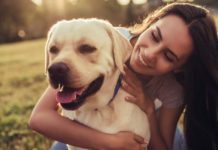 That doesn’t mean you shouldn’t go to the park – we have to find a balance that takes into account a dog’s need for social interaction and exercise. But it is food for thought when it comes to being a bit more self disciplined about picking up poops and disposing of them safely, even in open spaces. But the campaign to clean up the city sidewalks, and make poop illegal began long before then. New York City is credited with being the first city to implement a poop scoop Law in 1978. The regulations are part of health code article 161. 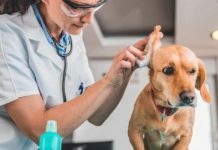 Long before 1978 there was already a law against leaving offensive animal matter in public places, but it wasn’t specifically aimed at dog owners, and was largely ignored. There was substantial opposition to the new pooper scooper laws and great resistance among dog owners. But gradually other big cities soon followed NYC’s lead and pooper scooper laws are now in force in many modern towns and cities around the world. 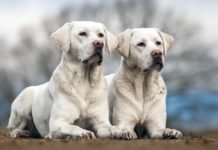 Current dog poop disposal laws vary from region to region, but in most areas they are quite strict and breach of the rules carries a financial penalty. Fines in the USA vary but can be in the region of hundreds of dollars. Making laws is one thing. Enforcing them is another. And local authorities have always found it challenging to catch those invading the poop scoop regulations. Video surveillance can help, and in some locations, authorities are even using DNA to track down the culprits! Enforcement is expensive though, as well as challenging. Perhaps the greatest weapon we now have in the war against poop is a change in public attitudes. Those who don’t pick up are now often shamed into doing so by other dog owners. In the US patent office you can find dozens of fascinating inventions for collecting and disposing of dog poop. A few of them have been successful and are now available to dog owners. But they do tend to be quite bulky and not the sort of thing you are likely to want to carry around with you on a walk. When you are out in public with your dog, the simplest approach really, is to grit your teeth, put your hand inside the poop bag, pick up the offending object and turn the bag inside out. 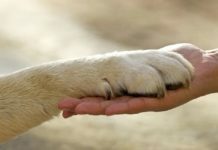 You shouldn’t ever have to touch dog waste with your bare hand. Double bagging might make you feel a bit happier about putting the parcel in your pocket for the journey home! Once that poop is safely in the bag, we need to think about how to dispose of dog poop. What is the best way, and are there any rules and regulations governing dog poop disposal? Let’s have a look! You wouldn’t be the first to wonder what to do with dog poop. But many of us feel a bit uncomfortable with the either of the first two options. In the USA government departments often recommend flushing pet waste down the toilet. Or placing it in a plastic bag and putting in the garbage. So these are reasonable options. Especially if you don’t have room in your yard for a composter. If you intend to flush your dog’s poop, make sure that there is no debris (leaves, sticks, stones) stuck to them! Your sanitary system won’t be able to cope. And never put standard poop bags down the toilet. Unless you really enjoy your plumber’s company. When you are out and about with your dog you have a couple of options. You can either dispose of your dog’s poop in a trash can, or take it home with you and flush it down your toilet when you get back. You’ll need to get it into a bag first! (See Dog poop pick up above) We have a review of dog poop bags here: The Best Dog Poop Bags. 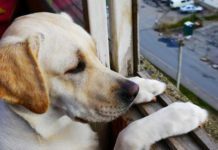 It’s a good idea to collect up your dog’s poop from your yard or garden on a daily basis. Even if you have a really large yard. Regular collection helps to reduce the risk of visiting dogs or children picking up infections, and also helps to reduce the risk of your dog becoming a poop eater! Poop scooping devices are useful for picking up poop at home. At the bare minimum you need a receptacle and something to push the poop with. Jaw clamp scoopers like this one are ideal. Turning dog poop into compost has great appeal. You can build your own composter or buy a commercially made one. The principle is the same. Dig a big hole, bigger than the container and place some stones in the bottom of the hole to help drainage. Some people like to put dog poop in a wormery. If you do this, don’t include dog poop from dogs that have been wormed recently. Attitudes to dog poop disposal have changed dramatically in the last few decades. This is a good thing because dogs are more than ever part of our families and our communities. And we need to make sure that association is beneficial to all concerned. That means minimizing any health risks that may arise from bringing dogs into our lives. Picking up poop isn’t fun, but it is an important and necessary job. Scented poop bags and poop bag holders can help make it a more pleasant task. At home you can get some handy gadgets to make your yard depooping easier, and keep your surroundings smelling sweet. Why not let other readers know which tools and methods you have found helpful? Before we go – back to that debate I mentioned earlier. Should you ever throw your dog’s poop bag in someone else’s trash can? What do you think? What’s with dog owners who bag their dog’s poop and then leave the bag of poop for the nearest property owner to deal with? Is that considered OK among dog owners? I don’t have dogs, and it grosses me out to have to pick up bags of dog poop. I’ve found bags of poop on a large rock in my yard that’s next to the sidewalk. Guess the idea is that I’ll notice it on the rock and be grateful they at least bagged it? Tonight the bag of poop was sitting on the lid of my garbage can, leaving it to me to open the can and throw it in — how not nice! Is this dog owner nuts or is this just standard OK practice among dog owners? I have two small dogs so I use the poop bags and bought a diaper genie for our garage. Our garbage is picked up twice a week so I empty the diaper genie the night before garbage pick up. It keeps my garbage can from having that horrible smell. I bought a container marketed for cat poop – it works great. Try googling “Litter Genie” to see the one I use. I try to pick up every poop that our dog has in a disposable bag while out on walks, obviously some get missed when the dog is in the undergrowth somewhere but at least it is away from the trail where walkers are. 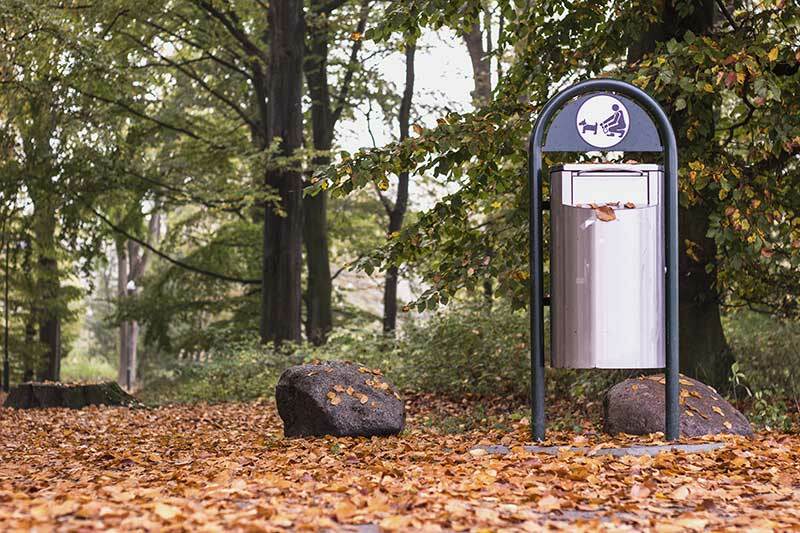 The poop bag will then be discarded in a bin destined for a landfill, often there are bins for this purpose at the entrance to walking parks and such spaces, at home the same applies with our own bin that goes to the landfill. What irks me while on walks is when you see poop bags discarded along the trail, and sometimes hanging from a shrub or tree? I put knotted bags in my trash can and it stinks w flies around it. Trying to find disposal that won’t stink up the trash can — maybe doggy dooley. I have two dogs and I carry poop bags for walks. I dispose in my own trash bin. The method I use to pick up at home … I call ” poop patrol” I have latex gloves that I use for efficient picking up in my own yard. I have tried the pooper scoopers, not good results, shovel…way to heavy to use one hand to push into bag and other to hold the bag. Doggy Dooley…not always available for use in snow country..it being buried and all…. So I use my gloves. I get it picked up quickly, efficiently and to my liking… since I don’t like my dogs walking in it and then coming into the house. Everything gets wrapped up in bags…gloves and all. Thanks for sharing. I would appreciate, dog owners taking more ownership of their dogs. Setting a better example for their community. There is no way I’d put dog poop in somebody else’s bin. My dog = my bin.